Next week we will be lounging on the beach shown above. 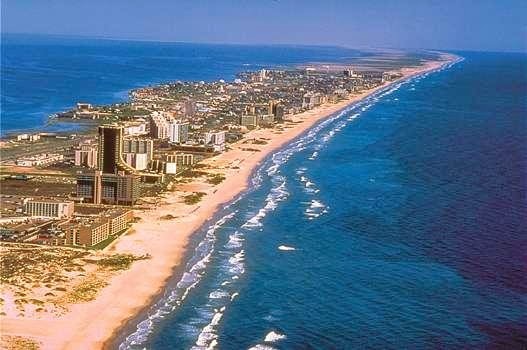 Also known as South Padre Island, TX. Also known as party capital of Texas... You might be wondering why I didn't post one of those gorgeous beachy pictures with palm trees swaying in the wind & some exotic beauty lounging on a hammock with a drink in her hand... That's because it's a Texas beach & honestly they're not that pretty! That's not to say they're not awesome and a perfect place to visit. SPI (as us crazy Texans call it) is known for they're major bars, huge partying college kids, wet t-shirt contests, etc. Yeah we ain't doing ANY of that! (Well definitely the bars one of the nights, but nothing too loco) Here's the main gist of our vacay... We go with The Hub's family to SPI every summer. It's amazing because we get to relax on a beach for 5 days, let the cousins play together, and just enjoy the vacation. (Beer in hand of course!) Something else we do, we all switch nights to cook. This year we're making steaks with baked potatoes & grilled asparagus. Yummo! This way it's cheaper on all of us and we get to spend the evenings together. We leave this weekend and to say we're ready to get the heck out of Dodge is an understatement! We're so ready to relax and get some sun it's unreal! So here's to our 1st vacay of the year. It will be a blast!